Located on a promontory overlooking the river Sûre, the castle of Bourscheid is gradually restored to its former splendor. Eleven watchtowers and a massive ring wall make the impressive fortification an excellent example of the medieval castle building. Prepare yourself for stunning views in every direction. This is Luxembourg at its best! Stone constructions in the centre of the enclosure date back to the 10th century, but archaeological excavations have yielded traces of earlier wooden defense structures from Carolingian, Merovingian and even Roman times. Construction of the extensive circular wall began in 1350. It was completed in 1384, together with the Stolzemburger house in the lower area of the castle. In years following a dungeon was hewn into the naked rock, with a bakery-house on top of it. A chapel was built and the warden's house with its two towers was erected to form the entrance. Palissades protected the square in front of the gate, where justice was spoken under a lime tree. In 1512 the last member of the house of Bourscheid died and the castle began to delapidate. From that time onward only bailiffs lived in the Stolzemburger house, which was rearranged as a residence in 1785. The last bailiff deserted the castle in 1803. 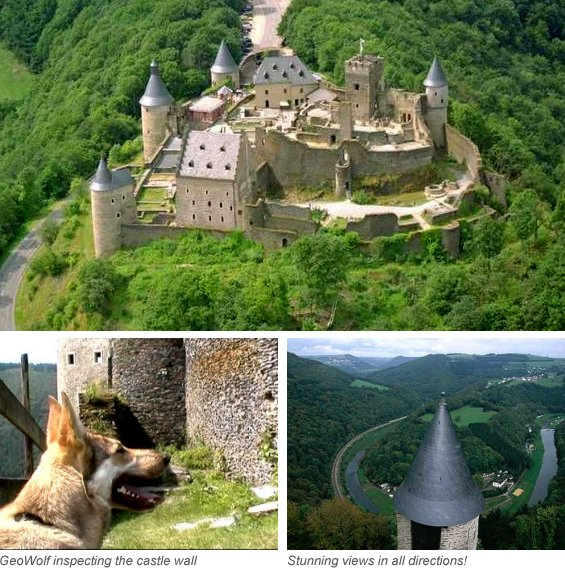 For more than a century and a half Bourscheid castle was privately owned. In 1972 the State of Luxembourg acquired the ruins and started the restauration work, first on the Stolzembourg house. Archaeological excavations probed into the ancient past of the castle. The recent publication of the Bourscheid archives, which were recovered in Gemunden in Germany, greatly enlarged our knowledge of the castle and its former inhabitants.